Here's the second part of the countdown to the best stomach exercise /best ab exercises. 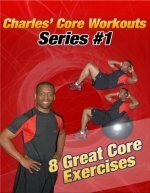 If you haven't seen the first part of this series, you can click to view the best ab exercises from 12-9. Of course, the list is just my opinion both as a physical therapist, personal trainer, and as someone who likes to exercise. I'll do my best to explain why each exercise is on the list of my favorite exercises. You can click on the links or pictures to get a more detailed description of how to perform the exercises. Here's Part II of the Best Stomach Exercise. I know I'll keep saying each exercise is one of my favorites, and stability ball crunches are no exception. I generally don't do floor crunches much anymore. 90% of the time if I'm personally doing crunches it's on a stability ball. And once my clients master floor crunches, it's onto the exercise ball. The ball does two things that the floor can't. 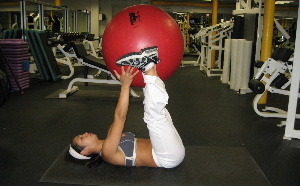 First, the ball increases the range of motion of the crunches, so you work your stomach muscles harder. And second, the ball increases your balance and coordination because it is unstable. I know the ball can be intimidating at first, but once you master using it you may never want to go back to regular floor crunches again. I really wanted to put stability ball crunches higher on my list, but I like the exercises that follow a little more. Don't get me wrong, on another day stability ball crunches could be much higher than #8 on my list and be the best stomach exercise. Stability Ball Piques are a fun and challenging stomach exercise. Sometimes the best stomach exercise is the ones that you think is fun, and sometimes the best exercise is the one that is challenging. The beauty of the stability ball piques is that for many people it's both fun and challenging. It's easy to get bored with any workout routine, and keeping your motivation high is important to maintain healthy habits. I have found that my clients really get focused on conquering this exercise, and when they master it they get a huge sense of accomplishment. If you can do a set of pushups and have mastered stability ball crunches, you might find this exercise keeps you focused on improving. The first time you try it, you may only be able to hold yourself in position long enough to complete 5 reps, but just keep practicing until you've conquered it. The swiss ball exchange is a good stomach exercise. I know this is the third ball exercise in a row, so it's obvious that I think using a swiss ball (stability ball) is an effective way to exercise your stomach muscles. This exercise is different from the previous 2 exercises because the ball does not challenge your stability. Instead, it provides slight resistance and stimulates additional core muscles like the inner thigh (adductors) and the back muscles (lats/ latissumus dorsi). You have to focus when you're performing this exercise, if not the ball might hit you in the face and if you're in the gym people might laugh-- just kidding. This exercise requires the body to do so many things that most people get a really deep burn in their stomach. If you haven't felt a good burn in a long time, try this exercise. It can be a little awkward if you have a really large ball compared to your height, and in truth the ball is partly for show since it only adds light resistance. I think this exercise is positioned perfectly right in the middle of the pack at #6. Reebok Core Board Exercises can enhance athletic ability and improve core strength. One of my favorite Reebok core board exercises is twisting knee raises. This exercise is a plank variation. You balance on hands and toes like in certain plank variations. Then, you twist to engage the upper body core muscles and lift the knee to engage the hips and obliques. It more like a total body core exercise that works you stomach muscles directly and indirectly. And because the core board, moves underneath you it really enhances coordination and sports performance. With athletic clients, I often incorporate core board exercises in a total body core workout and the plank with twisting knee raises is one of my favorite core board exercises. Okay, that rounds out Part II of my countdown to the best stomach exercise. You can also read my review of a scientific study on the most effective abdominal exercises and my article on finding the best abdominal exercise for your ab workout routine.